African American slavery is the economic foundation of this country, yet that deep systemic reality and its major and continuing impacts on the present are usually papered over or ignored, even by most contemporary scholars. A new film and book by the white descendants of the country’s largest slave-trading family, a northern family, make this neglect both obvious and problematical. First-time filmmaker Katrina Browne makes a troubling discovery — her New England ancestors were the largest slave-trading family in U.S. history. She and nine fellow descendants set off to retrace the Triangle Trade: from their old hometown in Rhode Island to slave forts in Ghana to sugar plantation ruins in Cuba. Step by step, they uncover the vast extent of Northern complicity in slavery while also stumbling through the minefield of contemporary race relations. In this bicentennial year of the U.S. abolition of the slave trade, “Traces of the Trade” offers powerful new perspectives on the black/white divide. An official selection of the 2008 Sundance Film Festival. In 2001 . . . Thomas DeWolf was astounded to discover that he was related to the most successful slave-trading family in American history, responsible for transporting at least 10,000 Africans to the Americas. His infamous ancestor, U.S. senator James DeWolf of Bristol, Rhode Island, curried favor with President Jefferson to continue in the trade after it was outlawed. When James DeWolf died in 1837, he was the second-richest man in America. In Traces of the Trade: A Story from the Deep North, Producer/Director Katrina Browne tells the story of her forefathers, the largest slave-trading family in U.S. history. Given the myth that the South is solely responsible for slavery, viewers will be surprised to learn that Browne’s ancestors were Northerners. The film follows Browne and nine fellow family members on a remarkable journey retracing the Triangle Slave Trade which brings them face-to-face with the history and legacy of New England’s hidden enterprise. Inheriting The Trade: A Northern Family Confronts Its Legacy as the Largest Slave-Trading Dynasty in U.S. History is Thomas Norman DeWolf’s powerful and disarmingly honest memoir of the journey. An urgent call for meaningful and honest dialogue, Inheriting The Trade illuminates a path toward a more hopeful future, and provides a persuasive argument that the legacy of slavery isn’t merely a Southern issue but an enduring American one. . . . For further information, go here: http://www.inheritingthetrade.com/. 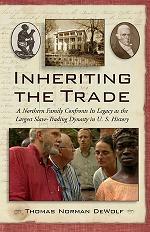 Inheriting the Trade reveals that the Northern involvement in slavery was as common as it was in the South. Not only were black people enslaved in the North for over two hundred years but the vast majority of all slave trading in the United States was done by Northerners. Remarkably, half of all North American voyages involved in the slave trade originated from Rhode Island, and all the Northern states benefited. Tom DeWolf and Katrina Browne are scheduled to be on the CBS’s The Early Show on April 29. Finding hopeful signs in a highly racialized society is not easy these days, but here is a very big one to chew on. I have read the book and I give it my highest and most enthusiastic recommendation. Part of the unfinished conversation about slavery in this country is the effect of the institution on the ENTIRE society and its inextricable presence in the foundations of capitalism. Also read Mark Rediker’s THE SLAVE SHIP and you will have a new set of insights into slavery and its role in shaping the United States and her social institutions. Great post, Joe. Looking forward to reading this one (and seeing the documentary). Hey Cheryl ~ great to see you here, welcome! Thanks for the additional recommendation of Rediker’s book. All I can say is, holy crap! 10000 people?? They found records indicating a minimum of 10K. Probably more…..
We really do cover up our history in the US, a history, if you believe the history books in high school, is basically about liberty, freedom, and justice…. What propaganda!